Finding the perfect gifts for the holidays doesn't have to mean long lines, crowded shops and impossible parking lots. There are countless craft festivals in the D.C. area where you can find handcrafted gifts and also enjoy music, refreshments and other events as you shop. The 12th Annual Downtown Holiday Market this year will include more than 150 local artisans and boutique businesses. Browse through gift items including jewelry, pottery, paintings and textiles. Some vendors and goods rotate daily, and you'll also find festive treats such as hot donuts and cider, plus live seasonal music. 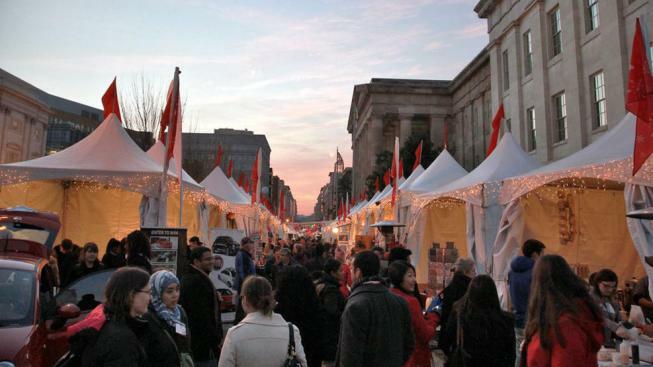 This annual festival offers unique art and craft items, live entertainment, and winter treats including hot cocoa -- oh, and hot wine. Kids can paint their own Christmas ornaments or have their faces painted for free at the market's Children's Corner. The festival also participates in a toy drive program to help Alexandria families in need celebrate the holidays. Rosslyn's fourth annual Holiday Market Festival will showcase 25 local and renowned vendors for all of your holiday shopping needs. When you've found something for everyone on your list, you can head to a holiday concert, a gingerbread workshop or even visit Santa. More than 20 local vendors will participate in this festive indoor marketplace. Whether you're looking for art, jewelry, decor or homemade snacks, the Made in DC Pop-Up Market offers something for you. Saturday, bring your four-legged friends to have a pet photo taken with Santa; all proceeds will benefit City Dogs Rescue and City Kittens. Known as an "alternative arts and crafts show," GRUMP will be taking place again this year at the Shops at Crystal City. Not only can you shop for handmade crafts, but you can also take photos with the GRUMPY yeti herself.